Sammet Pools, Inc. is a Florida state licensed (CPC 056904) fully insured bondable pool building company for custom residential & commercial swimming pools with a wide array of water features. Our custom pool designs come with over 25 years of pool contractor experience. Which brings the best construction knowledge to insure your pool is built to the highest standards & quality. 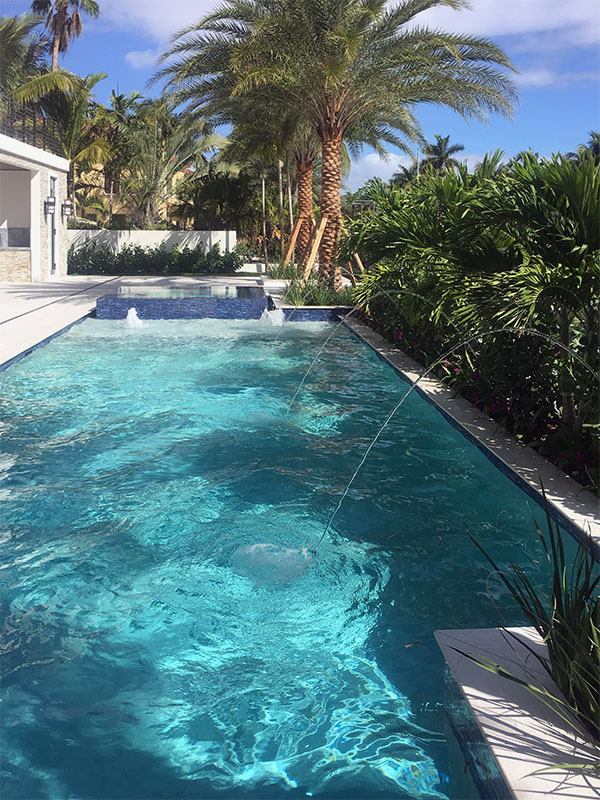 Sammet Pools, Inc. was established in 1993 and is one of South Florida’s premier pool builders. We have created hundreds of unique and innovative swimming pool environments. We offer free computer designs of your pool, spa, water feature, decking and landscaping needs. High Tech – Control your pool with your smartphone from anywhere in the world!!! Sammet Pools, Inc. uses a minimum 3500psi concrete with a minimum thickness of 6-8″ walls and 8-12″ floors. Another standard upgrade is increasing the pipe sizes which can maximize flow rates for better performance. Sammet Pools, Inc. also offers longer warranties by installing top of the line equipment. This upgrade enhances not only the clarity of the water, but the longevity of the interior finish as well. Another standard upgrade – Increased pipe sizes, with heated pools, we install floor returns – heat rises, this will maximize heating efficiency and performance. Equipment – We install only the very best equipment like Pentair & Jandy. We use the very best materials and equipment, personally inspect every phase of the construction process prior to its completion. Insuring attention to detail. To insure professional and expedient service, please call Sammet Pools, Inc. directly. We schedule service 24-48 hours in advance. We will determine if our technicians or the manufacturer’s warranty service center would handle the service call. A technician will respond within 48 hours. We hope by detailing the highlights of the way our firm conducts business, this will justify any price comparison with the production pool builders who might be advertising their packages versus “Your Custom Pool“. We encourage you to research our references and personally inspect the quality and craftsmanship on our completed projects, as well as any current projects under construction.